The Wall Street Journal Fake News headline says, "Apartment Fires Are Tied to Cheaper, Wood-Based Construction." This is bogus and wrong, buildings are being lit on fire and burned so quickly because the insurance industry allows builders to build with raw lumber. It's not younger juvenile lumber and EWP products that cause complete fire failure, the real fault for wood framed building fires during construction is we build them with kiln dried raw lumber. Builders today no longer need to take the risk to build with raw lumber. The industry is evolving and now there is safer and more effective fire protection proactively defending buildings from fire, coast to coast. It's no longer about being unable to afford building an entire structure with traditional pressure treated fire protected lumber, doubling the framing cost. Builders that are taking the risk are like seemingly saying hard hats, steel toed shoes, and fall protection is optional. Some builders recognize risk sooner than others, while some need it to become the law before making their buildings safer during construction. Building any wood framed building over 2 stories subjects all workers to the risk of death when they have to jump out windows to escape a job site fire like we just witnessed in Denver. The risky part of gambling to build with raw lumber is that Lawyer's now have the ability to win easy lawsuits, since they are well aware that protection exists and could have been used. Big builders need to support this new way to defend wood framed buildings from fire to combat all the negative press and propaganda that claim it's tied to cheaper construction. As an expert in fire and wood framed buildings for over 40 years, let me explain when wood framed buildings become really vulnerable to complete fire loss. In the photo above you can see the building is not completely sheeted and the floor system or roof system has not been installed and sheeted yet. This building is not as vulnerable as a wood framed building gets when the walls are all sheeted along with the floor and roof. Once the horizontal structural members are sheeted the wood framed building becomes very vulnerable to complete fire loss during construction and before drywall and sprinklers can help stall a fire advance. Fires that destroy during construction always start low down in walls that are sheeted typically with OSB. As the fire tries to head north it climbs the studs that are sheeted and as it ascends the chemical reaction is creating gases that are building up in the horizontal structural floor or roof that is sheeted. The fire needs to advance in order to survive, as it seeks more fuel and oxygen continues to climb and when it reaches the horizontal overhead enclosed structure where the gases are waiting it flashes over in minutes. At that point the fire is now looking like a bomb and the acceleration inside a wood structure moves as fast as a wild fire climbs a hillside full of dry brush. The last 50 high density wood framed fires had nothing to do with modern raw lumber or EWP they do have everything to do with building with kiln dried raw lumber that is not fire treated. Keep in mind these wood framed building fires move beyond what fire fighters can control before they even get out of site. Click to view. 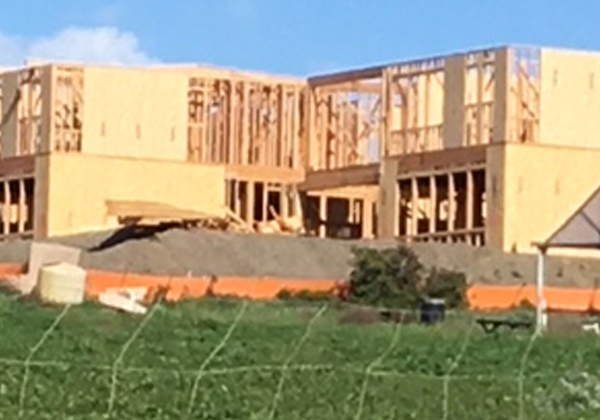 Fire Fighters will not go inside a raw wood structure under construction when its not occupied they are out there to control the building fire from destroying other neighboring structures. The best pro-active way to make wood framed buildings safer for workers is to start acting "Smarter Than The Wood" and fire protect it as its going vertical.